A Little Baker St Andrews produces traditional handmade organic sourdough breads plus a range of artisan croissants, cakes and savouries, all baked in a wood-fired oven. The process includes resting the dough for a minimum of 6 hours from mixing to baking, with this resting time giving the bread a unique flavour and texture and making it easily digestible. All the breads are both yeast and preservative free, using the Lactobacillus bacteria for fermentation. Local ingredients are used where possible, including: berries from Kinglake, honey from Hurstbridge, citrus fruits, mushrooms and olive oil. Now a cafe as well as a bakery. Alot of Good Stuff’s preserves, biscuits and loaves are all made from locally-sourced produce and high quality ingredients. They are handmade in small batches to assure peak freshness and maintain quality. They include gluten-free options. 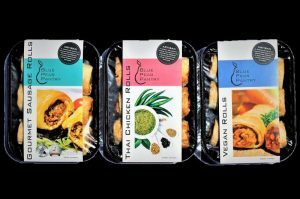 Blue Pear Pantry sell savoury rolls: sausage rolls, Thai chicken rolls and vegan rolls. They strive to use grass fed and free range meats in their rolls. Together with their homemade Thai curry paste, each roll is individually handmade in their home kitchen. They pride themselves on supporting other local businesses. From graphic design and stationery to suppliers and producers, they choose to use local business. Blue Pear Pantry have devised a range of fundraising options for kindergartens, schools and sporting clubs, with a particular emphasis on accommodating for allergens so that everyone can participate. Fill in the application on their website for more details. 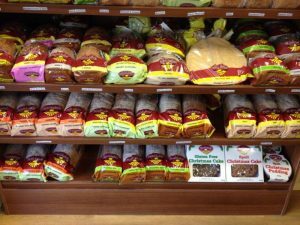 Caffe Strada makes a wide range of gluten free bread, which is available from both its own shop in Ivanhoe and a variety of other outlets in nearby suburbs. Caffe Strada is also a cafe which focuses on producing healthy, flavoursome gluten-free food. The cafe is a 100% gluten-free environment and they bake all of their products. Their homemade sausage rolls are fructose-free. Finally, Caffe Strada provides catering, with the options including finger food, sandwiches, salads, savouries and sweets. Read their catering menus. 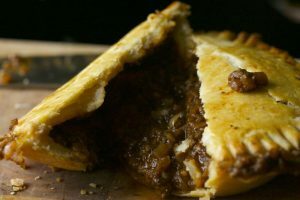 Using locally-sourced, grass-fed beef and free-range chicken from the Yarra Valley, Erin and David Turnley have built a solid reputation over the last 10 years as producing some of the best family gourmet pies in the region. Their pie range includes chunky beef, chicken, scallop, roast vegetable and apple. At the local markets that they frequent, you can also sample their array of pates which includes chicken, duck, salmon and venison. Basil and coriander pesto and duck and chicken terrines are also available for sale. All ingredients are sourced locally, with grass-fed beef, and chicken, duck and venison which is free range and hormone free. Everyone loves a good pie. You can get an average pie anywhere but a pie that surprises you with its complex flavour in a package so simple and familiar is rare. Gourmet Pies takes pride in its pies; quality ingredients and all handmade. The available pies include: beef and mushroom; beef burgundy; beef curry; chicken and mushroom; chunky steak; chunky steak and cheese; pulled lamb and caramalised onion; red lentil and ratatouille; scallop and saffron; tandoori chicken; traditional plain aussie pie; and vegetarian. For other local outlets, email them ([email protected]) with your postcode. Healthybake make a wide range of breads, mostly using Certified Organic ingredients and with all their products that being free from chemical contaminants such as pesticides, herbicides, heavy metal residues etc. Their range includes both wheat-alternative and gluten-free that are suitable for people with wheat allergies, diabetes or people wishing to eat healthy and experience different foods. They bake with ancient grains including, spelt, khorasan, oat, millet, barley and rye, as well as superfood and FODMAP friendly breads. Holy Crumpets make handmade sourdough crumpets. 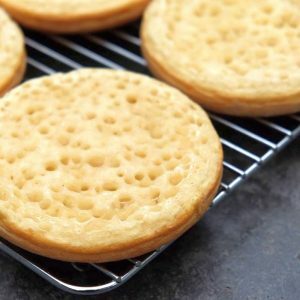 At farmer’s markets, they also sell the crumpets ready-to-eat: heated and with toppings. For Kylie, making bread is about lifestyle. Bringing quality ingredients to life with wild yeast culture, time and love, is a magical and immensely satisfying process. Shaping into loaves, setting to rise then baking where it springs to a golden nutritious food brings her great pleasure. 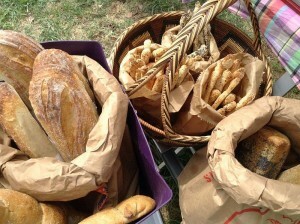 Then selling the product: watching people’s eyes light up at the sight and smell of home baked bread. Handing over the bread and knowing it will be eaten with pleasure, alone or shared with friends and family, bread is the stuff of life. Mama Bakes Naturally makes allergy-friendly hand-made treats which are completely free from gluten, dairy, egg, nuts, refined sugar, GMOs or any artificial ingredients. Products: Granola. Some baked goods. My Goosey Gander currently focuses on making granola and some baked goods. The granola is made with all certified organic ingredients, lightly toasted and slightly sweetened with maple syrup and rice malt syrup. Mixed by hand and baked in small batches. The baked goods are gluten, dairy and refined sugar free, using (where possible) locally sourced, certified organic and free range ingredients. In the future, it plans to offer other breakfast options for those with intolerances and alternative lifestyle choices (paleo etc). 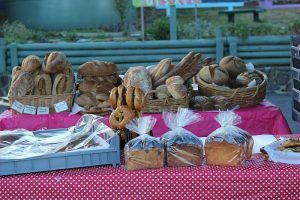 Currently, the granola can be ordered online and the baked goods can be bought at Natural Food Market, Montmorency or Platform 3095, Eltham. Local outlets: Order by phone or email. 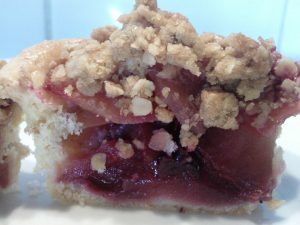 Anita makes individually handmade pies, crumbles and baked cheesecakes from her registered home kitchen. Made with love, passion from her to you. Being Australia’s first apple pie food truck, she has started a revolution! Bringing apple pies direct to you for your special event or function. Multiple award winner in the Australian Food Awards and The Official Great Aussie Pie Competition. 1. 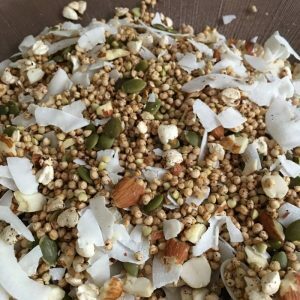 Grain-free – the only flours used are made from almonds, coconuts & chia seeds so they are rich in both nutrients and healthy fats. 2. Low carb – 80% lower in carbohydrates than regular whole wheat bread. 3. Starch-free – whilst starches such as tapioca are technically grain-free, they are also highly refined, high in carbohydrates and will spike your blood sugars in the same way as regular white flour. 4. 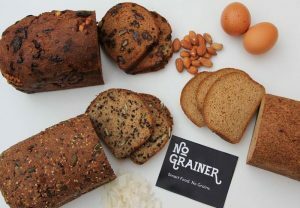 100% paleo – the bread contains no dairy, pseudo grains, bean flours or gums. Rather than use bean-based gums to bind the bread, they use organic psyllium powder. Old Evropa’s products include focaccia classica (with cherry tomato & olive), focaccia nera (olives only), pain ordinaire, pain de campagne, pain de Provence and pain au Levain. All their products are handmade, utilising traditional time-honoured methods, using only the finest organic ingredients. The long fermentation enhances the products’ flavour and makes them suitable for people with gluten sensitivity. 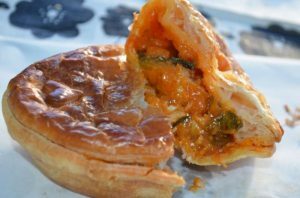 Palace Pies make vegan savoury pies, including minced mushroom pie, chilli chipotle pie, spinach & ricotta pie (soy) and roasted cauliflower pie. They do not use faux meat or dairy products, instead embracing the humble vegetable and letting it speak for itself. 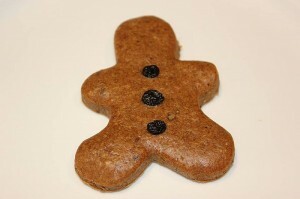 Their pastry is simply made from flour, water, coconut oil and nuttelex. They believe in sustainability in all facets of their business, from the produce to the packaging. Artisan bread with real ingredients. Pure sourdough bread with organic flour, variates including rain, white, olive, spelt, wholemeal, apricot walnut honey. Rye sourdough, including plain rye, seeded rye, 100% rye. 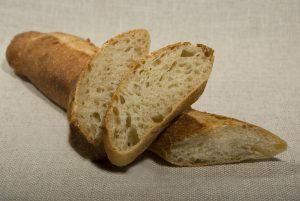 Other bread such as ciabatta, baguettes, raisin, brioche. Bread rolls such as pretzels, onion, cheese, rye, panini and rye. Sweets, including almond croissant, choc croissant, fruit bun, homemade cookies. 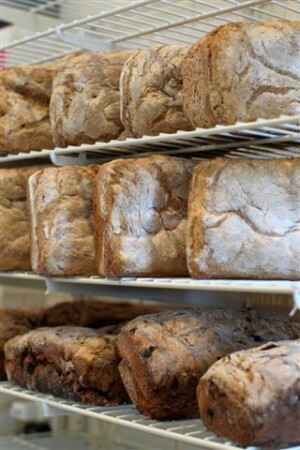 Starting with organic stoneground flour with no flour improvers or artificial enhancers, Rustic Sourdough’s bread is handmade the old-fashioned way. Sourdough baking is a long process due to the absence of added yeast: from start to finish, the baking process takes up to 36 hours. After a long fermentation process, the tender dough is slipped off the peel on the stone oven floor to slowly rise into a handsome loaf. With a toasted, crunch crust and a soft, chewy, moist crumb, this bread is delectable. Homemade syrup waffles (stroopwafels) and chocolate brownie waffle cookies. 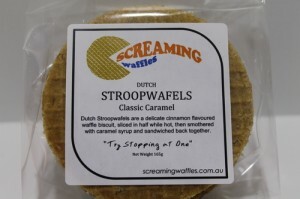 The stroopwafel’s recipe has been developed over many hours to get the right balance of texture, spices and (of course) taste in the dough and the caramel syrup. The stroopwafels come in different shapes and sizes and are baked fresh on a daily basis. A gluten-free version is also available. Products: Cakes and croissants. Also, sausage rolls, pies and quiche. 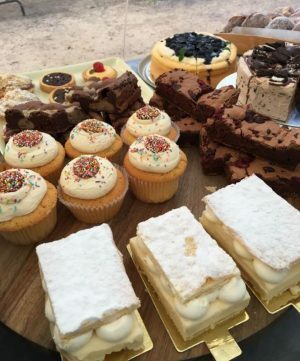 The Cake Stall is a home-based patisserie who concentrate on quality ingredients for quality tastes. Their sweet products include: almond croissants, baked cheesecakes, tarts, flans, brownies, muffins and whole cakes. 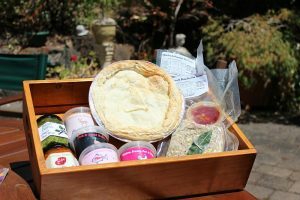 Their savoury products include: homemade sausage rolls, pies and quiche. 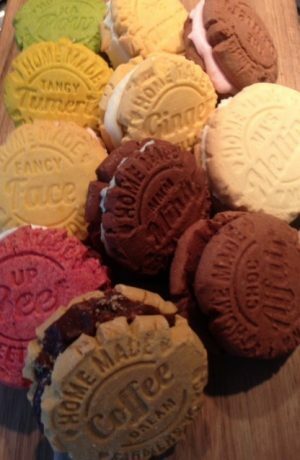 The Farmers Yo Yo make homemade, handmade, yo-yo shortbread biscuits made with all natural, all Australian ingredients. There are around 14 different flavours (including chocolate, coffee cream, lemon, mint slice, mocha, raspberry and vanilla). The Farmers Yo Yo family have been baking for 40 years. Turners Bakehouse Eatery is a historic bakery offering authentic sourdough breads, pies, cakes and pastries baked in its traditional wood fired Scotch oven that was built in the late 1890’s by Charles & Stephenson Turner. After being closed in the 1940’s and left vacant for many years, the bakery has been lovingly restored. Their signature hand-made sourdough is made with a mother culture of wild natural yeast that is over 100 years old and which is fed and cared for daily. Ask for a tour of the bakery.